Blairgowrie Trading Pty Ltd v Allco Finance. Allco – Webb Henderson (Solicitors), AJ Payne SC and R.M. Foreman (Counsel). David Coe’s Estate – Arnold Bloch Leibler (Solicitors), G.K.J. Rich SC and S.A. Lawrence (Counsel). KPMG – Ashurst (Solicitors), J.K. Kirk SC and P.D. Herzfeld (Counsel). 3 November 2016 for Directions. On September 2016, orders by consent were made in respect of evidence, the Court Book, live transcript for the hearing and a mediation on or by 4 November. If the claim does not settle, the trial is to commence on 14 November 2016 and continue until 16 December 2016. Importantly, an Opt Out Notice has been published which expires on 21 October 2016. (b) suffered loss or damage by the conduct of Allco, David Coe and/or KPMG. Open class with Opt Out Notice expiring on 21 October 2014. Application for common fund failed. All other proceedings are statute barred. Allco operated a financial services business specialising in structure asset finance, funds management and debt and equity funding, and was a major player in the leasing of aircraft, ships and other vehicles. 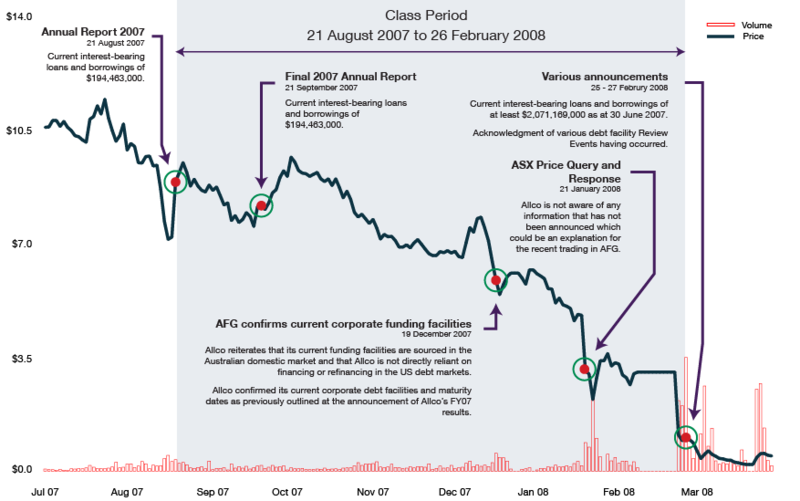 (b) From 1 November 2007 onwards, Allco should have informed the market of a review clause in the facilities with its lenders. Allco is the primary defendant in the cases. David Coe’s Estate is joined, alleging he was involved in Allco’s breaches. Allco’s auditors, KPMG, are also being sued over the misstatement of current liabilities in the 2007 Annual Report. The claims cover shares in Allco purchased between 21 August 2007 and 27 February 2008. The Respondents are cross-claiming against each other. 1. Common Fund (7 August 2015). 2. Settlement Approval (20 Ocotober 2016). 3. Settlement (11 January 2017). 4. Settlement (31 March 2017).